Living in America, I naturally encounter less Japanese now. That doesn't keep me from learning new "Japanglish" - also known as 和製英語 (わせいえいご) - that is, English words that have been co-opted by the Japanese language, but usually differing in meaning either slightly or to a strange degree. A while ago at work, during one of our daily meetings (which are held in Japanese), my colleagues were discussing the current conflict between AT&T and the FCC. Without throwing too much telecom technobabble at you, the Federal Communications Commission wants to limit the bigger players in an upcoming airwave license auction, meaning that AT&T and Verizon wouldn't be able to participate to the degree that they may want to. AT&T has threatened to boycott the auction, knowing that the government needs to raise as much money as they can, in the hopes of changing the FCC's mind. The FCC thinks AT&T is bluffing. So my cohorts were referring to this showdown as a game of chicken. They were using the Japanese expression, however, which I was unfamiliar with at the time. I'm glad they said it a few times, because I couldn't pick up what they were saying right away. Well, it turns out that "playing chicken" in Japanese is 「チキンレース」. 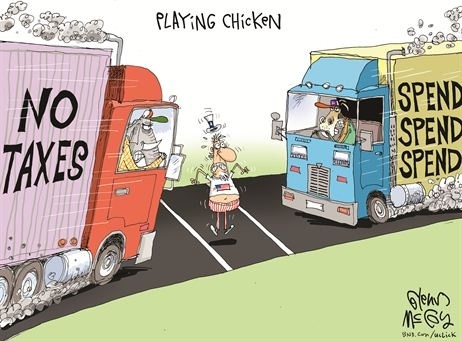 "Chicken race." Wikipedia indicates that it can also be called 「チキンゲーム」("chicken game"), but that in Japan it's typically called "chicken race." Oh look - I have successfully injected politics into this informative article about Japanese!